Armstrong World (AWI - Get Report) , Lennox International (LII - Get Report) , Masco (MAS - Get Report) , Owens Corning (OC - Get Report) and Vulcan Materials (VMC - Get Report) provide products and materials to all segments of the housing market, including new home construction, home resales and home improvement. The weekly charts for these five stocks have been negative since mid-September. These stocks are components of the PHLX Housing Index which includes 19 components, of which 11 are homebuilders. Armstrong World makes ceilings and cabinets. Lennox provides air conditioning and heating systems. Masco manufactures home improvement and building products. Owens Corning makes insulation, roofing and siding products. Vulcan Materials manufactures the ingredients for concrete and cement. 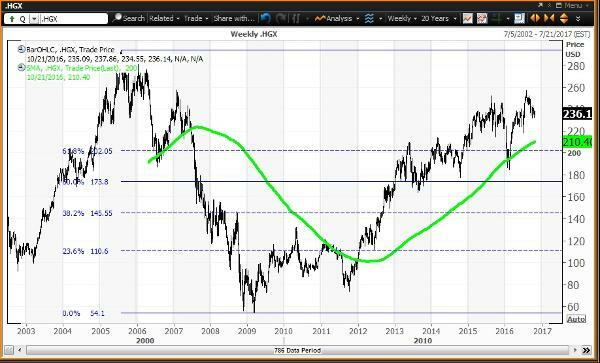 The weekly chart for the housing index shows horizontal lines that are the Fibonacci Retracements of the decline from its July 2005 high of 293.66 to the March 2009 low of 54.31. The crash of 2008 totaled 81.5%. The index has been above its 61.8% retracement at 201.87 since the week of Feb. 26. The key level to hold is the 200-week simple moving average of 210.40, last tested as the "reversion to the mean" during the week of Feb. 19 when the average was 194.84. Here's the scorecard for the housing index and five housing-related stocks. The weekly charts show a red line through the price bars, marking the key weekly moving average (a five-week modified moving average). 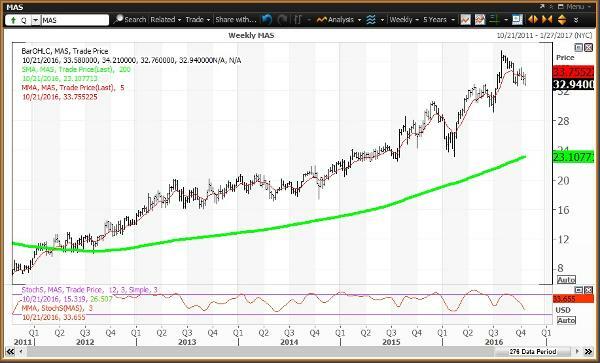 The green line is the 200-week simple moving average, the "reversion to the mean." The study in red along the bottom of the chart is weekly momentum (a 12x3x3 weekly slow stochastic), which scales between 00.00 and 100.00, where readings above 80.00 indicate overbought and readings below 20.00 indicate oversold. 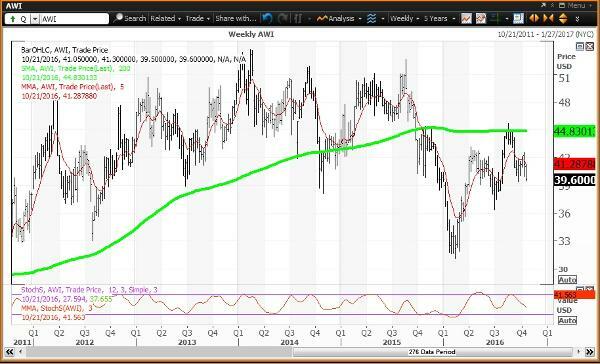 A negative weekly chart shows the stock below its key weekly moving average, with weekly momentum declining below 80.00 in a trend toward 20.00. Armstrong World closed Wednesday at $39.60, down a fractional 0.1% year to date. It is in correction territory, 13.4% below its multiyear intraday high of $45.75, set on Aug. 16. The stock is also in bull market territory, 27.2% above its Feb. 11 low of $31.13. 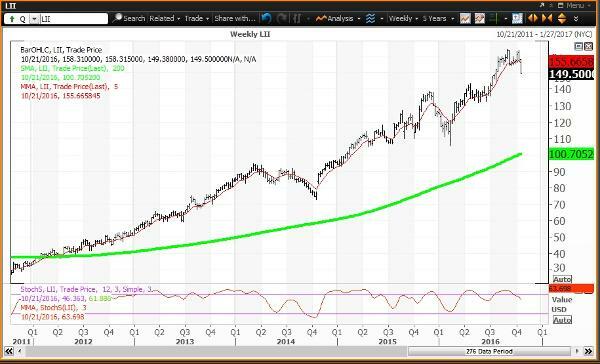 This stock set its all-time high of $53.64 in February 2014. The weekly chart for Armstrong World is negative, with the stock below its key weekly moving average of $41.29 and below its 200-week simple moving average of $44.83, last tested during the week of Aug. 26. The weekly momentum reading is projected to decline to 41.56 this week, down from 48.55 on Oct. 14. Investors looking to buy Armstrong should buy weakness to $37.02, which is a key level on technical charts until the end of 2016. Investors looking to reduce holdings should sell strength to $41.95, which is a key level on technical charts until the end of 2016. Lennox closed Wednesday at $149.50, up 19.7% year to date. It is 8.9% below its all-time intraday high of $164.02, set on Sept. 2. The stock is in bull market territory -- 41.5% above its Feb. 8 low of $105.65. The weekly chart will be downgraded to negative with the stock below its key weekly moving average of $155.67 and well above its 200-week simple moving average of $100.71. This week's decline resulted from the negative reaction to earnings reported on Oct. 17. The weekly momentum reading is projected to decline to 63.70, down from 72.36 on Oct. 14. Investors looking to buy Lennox should buy weakness to $140.53, which is the 200-day simple moving average. Investors looking to reduce holdings should sell strength to $159.34, which is a key level on technical charts until the end of next week. Masco closed Wednesday at $32.94, up 16.4% year to date. It is in correction territory, 11.9% below its all-time intraday high of $37.37, set on July 28. The stock is also in bull market territory, 42.6% above its Feb. 8 low of $23.10. The weekly chart is negative, with the stock below its key weekly moving average of $33.76 and well above its 200-week simple moving average of $23.11. The weekly momentum reading is projected to decline to 33.66 this week, down from 42.82, set on Oct. 14. 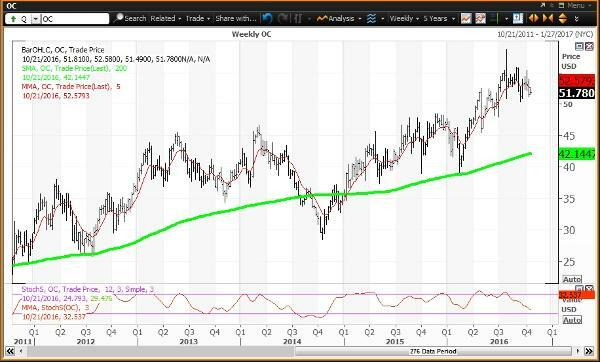 Investors looking to buy Masco should buy weakness to $31.48, which is the 200-day simple moving average. Investors looking to reduce holdings should sell strength to $35.32 and $36.94, which are key levels on technical charts until the end of 2016. Owens Corning closed Wednesday at $51.78, up 10.1% year to date. It is in correction territory, 11.8% below its all-time intraday high of $58.69, set on July 27. The stock is also in bull market territory, 32.9% above its Feb. 10 low of $38.96. The weekly chart is negative, with the stock below its key weekly moving average of $52.58, and well above its 200-week simple moving average of $42.14. The weekly momentum reading is projected to decline to 32.54 this week, down from 36.41 on Oct. 14. Investors looking to buy Owens Corning should buy weakness to $48.76, which is a key level on technical charts until the end of 2016. Investors looking to reduce holdings should sell strength to $53.58, which is a key level on technical charts until the end of 2016. Vulcan Materials closed Wednesday at $110.43, up 16.3% year to date. It is in correction territory, 13.2% below its multiyear intraday high of $127.20, set on July 28. The stock is also in bull market territory, 40.1% above its Jan. 20 low of $78.83. This stock set its all-time high of $128.62 in April 2007. 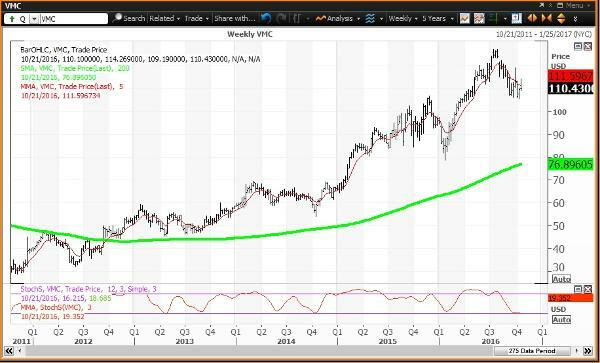 The weekly chart is negative, with the stock below its key weekly moving average of $111.60. It is above its 200-week simple moving average of $76.90. The weekly momentum reading is projected to decline to 19.35 this week, down from 20.92, moving below the oversold threshold of 20.00. Investors looking to buy Vulcan Materials should buy weakness to $105.20, which is a key level on technical charts until the end of next week. Investors looking to reduce holdings should sell strength to $116.42, which is a key level on technical charts until the end of 2016.